Field Day 2012 opened today at 1:00 pm CDT. 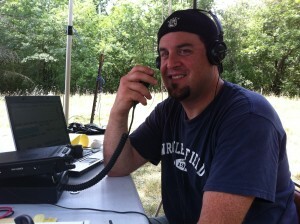 Field Day is an annual event organized by the American Radio Relay League (ARRL) in Newington, CT. Many amateur radio operators, or ‘hams’, belong to this national organization. Field Day is a twenty-four hour period in which ham radio operators test their ability to set up and coordinate emergency communications in the event of disaster. You may ask, “Why go to all the trouble when we have cell phones and the Internet?”. Well, often in times of disaster, these systems fail for many reasons. Ham radio operators are able to communicate with each other without relying upon any of these systems or even power from the electric company. This means that when disaster strikes, in many cases, ham radio is the ONLY way to pass emergency traffic within or out of the affected area. This year, our Field Day site was an empty lot in Wauconda, Illinois. 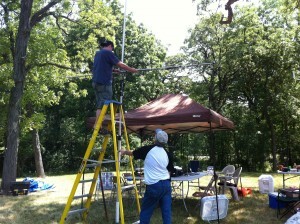 April M. Williams (N9GYG) and I (KE9AU) arrived around 9 am to help with the set-up of our club’s Field Day station. We belong to SUHFARS, the Suburban UHF Amateur Radio Society with members from McHenry and surrounding counties. Our club has about 50 members from around the Chicago area. When we got there, things were already well under way. The first job was to erect the antenna systems. This was not trivial, as some antennas needed to be pretty high up in the air in order to have the best signal. 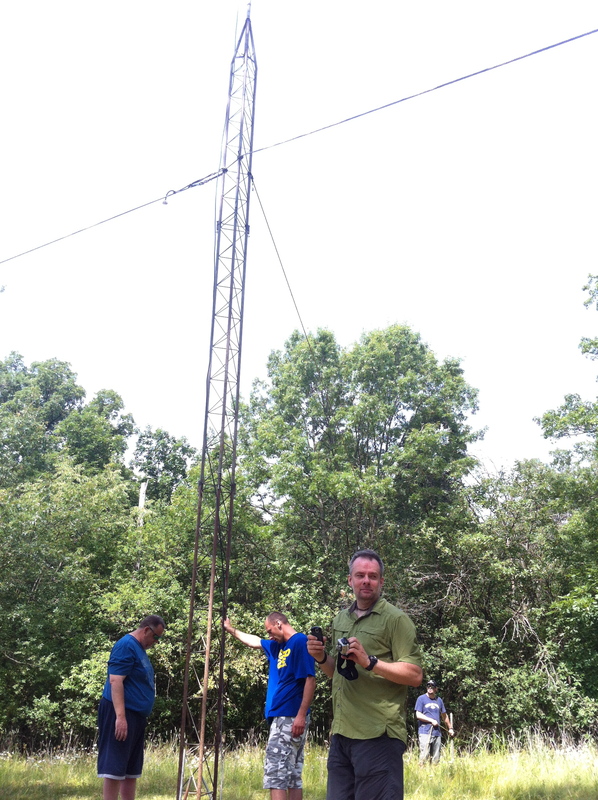 We quickly assembled a 50 foot tower and, with coordinated teamwork, put it upright. Next, we strung up a 300 foot wire antenna through the trees and then set up the radio equipment. By 1 pm our emergency station, running on generator power, was on the air and making contacts with other hams across the country. Our station will be operating throughout the night, testing the ability of our members to reliably communicate with others under less than ideal circumstances. There are more than 700,000 ham radio operators in the USA and our numbers are growing. To learn more about this great hobby and indispensable public service go to ARRL. See all the photos on the SUHFARS Facebook page. Learn more about joining SUHFARS.